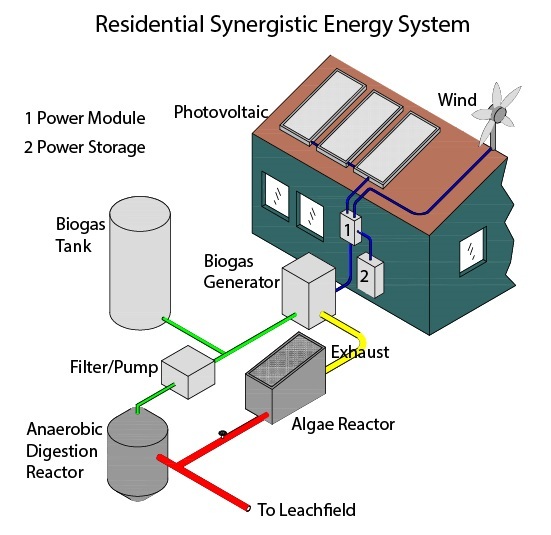 Synergistic Residential Energy Systems A single sourced energy system is less efficient than a synergistic system with multiple sources of energy. This division provides for redundancy so that multiple systems can meet the needs of a residential household in case of a system failure or maintenance and provide complementation in times of peak demand to reduce the size of each component and make the whole system more efficient. Additionally, inherent fluctuations of the energy source as with photovoltaic systems require larger storage capacities to meet the peak household demands. A synergistic system makes use of multiple sources of energy which are available on site and reduce the fluctuation and storage capacity. A typical house designed by Green New World has three mechanisms to generate electricity which are can be met with a combination of photovoltaic, wind and biogas. Solar and wind cover the average electric energy needs and peak demand is supplied by a biogas generator. Residential hot water can be provided for by geothermal, solar, biogas and wood or biobricks/ biopellets made from sludge. Much of the needs for space heating and cooling are provided for by design and materials of the building which reduces or eliminates further need for climate adjustment. Additional heating and cooling systems can be integrated as required such as heating using an efficient fireplace, geothermal heat exchangers that are supplemented with biogas and solar. Wind capture by a wind scoup and evaporation chambers are efficient and energy independent methods to cool a residential structure in combination with the integrated design features of the building.